Your first consideration should be asking yourself how the space will be used. Family dinners? Entertaining large groups? Sunbathing? Morning coffee? Marshmallows toasting on a fire pit? There will be hundreds of good ways to use the new space but determining what is important to you will shape the project. Next thing to consider for your patio design is the location. Typically a patio adjoins the house or a deck but a more secluded location out in the yard could offer a quiet place to escape with a good book or the perfect spot to put your feet up with a glass of wine. The answers to how you will use the space will lead you to the natural placement. But equally important is the orientation of the patio. You will need to think about designing the patio to provide best views of landscaping or to take advantage of lighting (sun and shade) at certain times of the day. 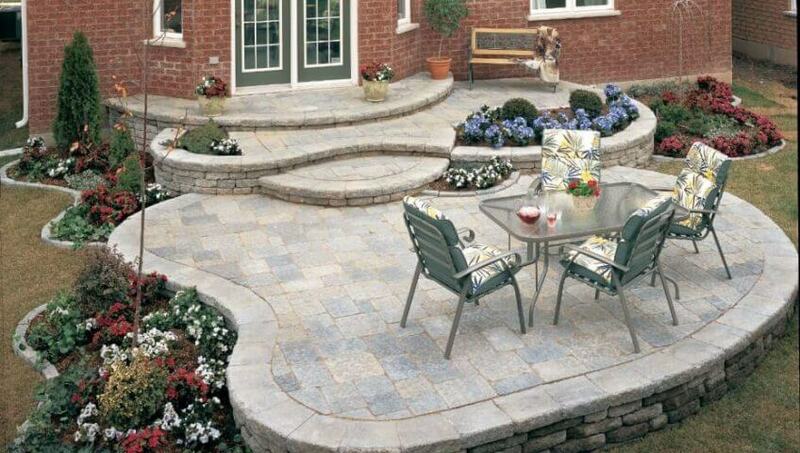 Planning the size and shape of your patio design is going to take more thought. It would be really easy to just throw out a random size, but thinking it through is very important. Way too often home owners will end up with a space that is smaller than they envisioned or an ungainly patio that erodes any feeling of intimacy. Additionally you need to consider the scale of your home. You don’t want a modest home that’s out ranked by the size of the patio or a teensy patio that’s dwarfed by a large home. This is probably the most important facet of your planning considerations — take the time to think it through so you will end up with the perfect outdoor space. If you can’t hire a professional, then think like a professional. Look back at your first step in this process (determining how the space will be used) and flesh that out. If the patio will be for family dinners, think about the cooking equipment you will be using. Do you want a full outdoor kitchen or a spot for a portable grill? Do you need a prep station or will the grill have side shelves? How big will the dining table need to be? Do you also want a relaxing space? If your patio design needs to accommodate entertaining large groups, consider whether that will include sit down meals or cocktail functions. Is a bar required? Will you need running water at a sink? Should you incorporate seating walls to reduce the need for furniture and maximize space? Whatever the use of your space might be, your patio design would benefit from considering your furniture. If you know what pieces you will be buying, then get measurements and plan a layout. You might even want to go so far as to cut out templates from newspaper. Arranging these models will give more perspective to your patio design. Also, plan on leaving at least two feet around furniture and equipment to allow for flow. While thinking through the fundamentals like location and size are crucial, you don’t want to forget about the style or feeling you want to incorporate in the patio design. If your home is Mid-Century Modern, then straight lines and multiple levels would be very complimentary. If your home has a bohemian vibe, a rustic patio would blend in well. Knowing the style you want to project will determine the materials that are used. Okay, you have determined use, location, size, style, now it’s time to think about outdoor lighting. You will want appropriate levels of light for different areas. For example, brighter lighting for the cooking area, more subdued lighting for the designated relaxing space. Sketching out the patio design with furniture and cooking elements in place will give you a good blueprint for all lighting considerations. Don’t forget about family and guest safety. Stairs and steps should have good lighting. If there is a slope to the yard that means a deep step off any edge of the patio, consider putting in a safety rail. The addition of a fire pit means thinking through all materials and a location away from high traffic areas. Your patio design should look at the big picture and always put safety first. Hopefully these steps will help you design a space that is just right for your family, but if this process is at all intimidating to you, think about hiring a professional landscape contractor to guide you. Whether you do it yourself or bring in the pros, keep your eye on the prize and know that all the work will add value to your home and create a place to make wonderful memories.